Board index MAGIC Witchcraft dead roach in hecate chalice. does that mean anything? 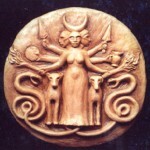 last night I performed a ritual for hecate on my altar. I always give offerings for her. I usually use water but this time I gave her milk. Only because I offered her cake, so why not milk. Lit some candles, and went to bed. Next day, I checked on my altar and found a little dead roach in the chalice where I put the milk in.. Now I know you guys are going to say well 'CLEAN IT' but I just have this weird filling about it. does this mean she didnt like my offerings ? can hecate manifest into a roach? Is she trying to tell me something ?